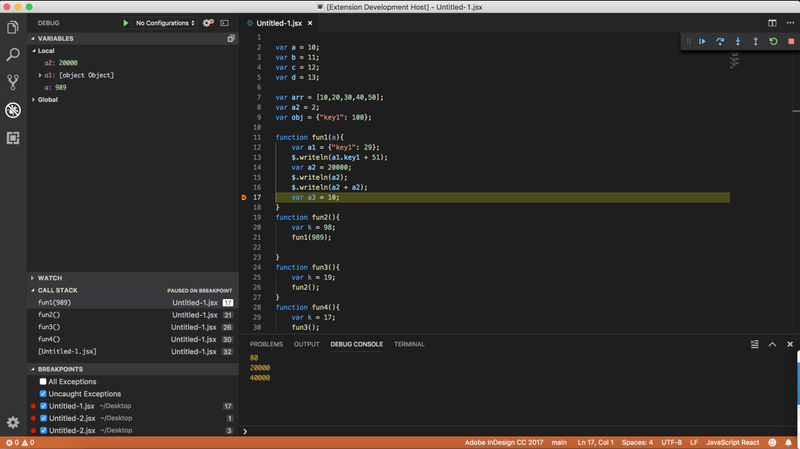 Update, March 2019: The ExtendScript Debugger for VSCode is currently available in the VSCode Marketplace for macOS. Given recent issues with ExtendScript Toolkit, the future of development tools for ExtendScript developers and users has once again become a subject of debate in the community. As many have guessed, a new version of ExtendScript Toolkit is not in the works. However, we have something coming up for you that will replace ESTK for many of its most popular use cases. 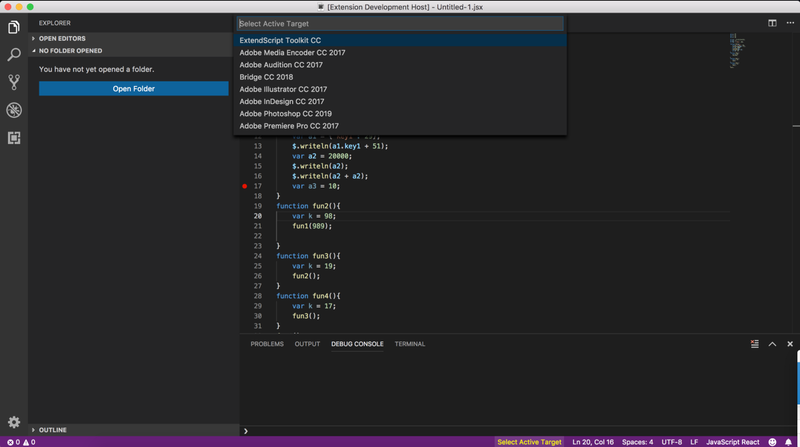 That something is a plugin for Visual Studio Code (VSCode), Microsoft’s popular and extensible IDE. If VSCode is new to you, have a read about plugins for VSCode. While we don’t have a timeline to share with you yet, we’d like to provide some early details on what the VSCode plugin will do. A lot made it on the list of supported features, but not all ESTK features will make the journey into the VSCode plugin. See the lists below to learn what will be supported and what won’t. We know that some of the unsupported features will come as a disappointment to long-time users, but our hope is that we’ve covered most of the mission-critical debugging features. In the case of JSX syntax highlighting, we’ve heard that there are community projects that may serve that purpose. If you know of any that you want to recommend, please let us know in the comments. Make sure to follow this blog so we can update you on our progress over time. We’ll have more to share over the coming months. You can also sign up for the CC Developer Newsletter to get monthly updates on the latest news from Creative Cloud for developers. In the meantime, if you have questions, ask us here in the comments.